In Real Estate When in Doubt Disclose! In Real Estate when in doubt it is always better to disclose, disclose, disclose! There is no point in hiding things in Real Estate as it is very easy to end up in a nasty law suit. Laws vary by state on what needs to be disclosed but as a general rule any material fact that could effect the value of a property should be disclosed to a buyer. Buyers and sellers need to understand it is the Real Estate agents job present everything that they discover about a property. 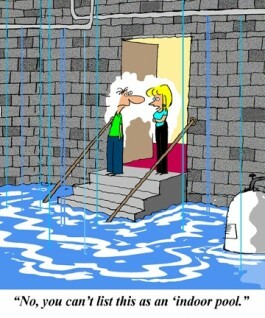 As an example, if a Realtor happens to see water coming into the basement of a home they are marketing, they sure as heck better be letting any future buyers know about the existence of this problem. If a Realtor is asked a direct question about a particular property, they must give an accurate and truthful answer to the best of their knowledge. Additionally, a Realtor cannot try to avoid discovering the details of a suspected problem. Avoidance of an issue does not work as an excuse. Years ago when I got into the Real Estate business it used to be “let the buyer beware”. Now it is “let the seller and their Realtor beware”. My position has always been if you have even the slightest question about whether or not to disclose something to potential buyers, avoid the potential for liability and tell all. There will always be fine lines on things that need to be disclosed as a recent Massachusetts lawsuit regarding second hand cigarette smoke suggests. Attorney Rich Vetstein of Framingham Massachusetts does a great job covering this story over at his Real Estate law blog. You can read about it at Lawsuit over second smoke against Realtor raises a stink. Essentially the case is about a women who suffers from asthma claiming that her agent failed to disclose that a heavy smoker lived downstairs. When visiting the unit, before her purchase, she was assured by the Realtor that the cigarette smell would go away once she painted and fixed up the place. Just reading that statement gives cause for concern. Is it any wonder why their are so many lawsuits in Real Estate? Where do you draw the line when it comes to issues of those living around you? Every persons interpretation of what is considered a nuisance is different. Fortunately for this Realtor and more than likely for other Realtors in future cases, the jury decided that it was not reasonable for the agent to be responsible for the knowledge of a smoker in another unit. The take home message here that might be missed, given that the Realtor won the case, is never to make statements for which you are not 100% sure of. 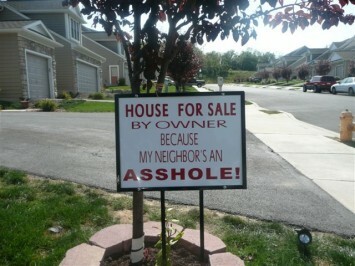 Realtors should always be wise about what comes out of their mouth. As someone who has been selling Real Estate in the Metrowest Massachusetts area for the last twenty four years can attest, why make statements you can’t possible know unless you are clairvoyant. Great looking blog, Bill. I’m going to check in to this later today. Thanks for the tip! Debe the sign kind of makes you wonder who really is the A-hole doesn’t it? Hi Bill, where does Massachusetts stand on disclosures for REO properties? Would this issue even get covered. In CA, seller of REO property is not required to issue what we call our transfer disclosure statement. Thanks for thought provoking article. In Massachusetts the fact that a property is bank owned does not negate a Realtors duty to disclose known facts about the property that could impact the value. The disclosure statement is not a requirement in Massachusetts but does not absolve your duty as an agent to disclose defects you are aware of. Bill, the sign is hilarious! No doubt about the motivation of this Seller. Awesome blog, I enjoyed the sign! Quick question for ya, In Mass is the lead paint disclosure required? Are there any other disclosures required by law? Thanks for the compliments on my blog Roland! In Massachusetts any home built prior to 1978 is required to have a lead paint form signed by both the buyer and seller of the property. Anything else that could substantially impact the value of the property or influence the buyer in purchasing is supposed to be disclosed. Bill, That was a great blog but I still have a question about disclosure. Is the law still the same if a home or property is suspected of having paranormal activity, or even scientifically proven to be haunted? Have you ever ran into that before? I know I’m a long ways away from you but I can not get an answer in my area of the map…Mid West. Can you tell me if a seller is required to disclose that their house is in a flight path? We are scheduled to close on a house next week and I just learned that the neighborhood in which we are buying is directly under a flight path for a smaller airport. The neighbors say it is a nuisance and sometimes wakes them up early mornings etc. I did not factor this in when making an offer and this is all news to me. Hi Evangeline – My best guess would be no since with a little research you should be able to find this information out. This however, is a question you would want to ask an attorney. Amy based on what you have described I have no doubt that you have a very strong case for suing this agent. A know issue like this is absolutely something that should be disclosed. The fact that you asked a direct question and the Realtor lied makes it even worse. I recently purchased a home in Tennessee, but have been unable to live in the home since I bought it! The home has a horrible infestation of brown recluse spiders and fleas! Neither were noticeable the several times we saw the property before we bought. However soon after we moved in my 7 year old son yelled that a spider was crawling across his floor. My husband wen up to kill the spider and he noticed it was a brown recluse. My husband previously worked for a pest control company right out of high school and knew a lot about spiders, insects etc. My husband then put out sticky boards and soon we had dozens on the sticky board. We have two children and do not feel safe staying in the home because of the infestation. Do we have any legal options? We have hired a pest control company and spent hundreds just in the last month trying to get rid but the spiders are VERY hard to get rid of once your home is infested. We are at a loss and don’t know what to do!!!! Laura in my opinion I think the answer is pretty cut and dry. You mentioned your husband worked for a pest company. If he did not realize their was a bug issue how could you expect the Realtor to know? Unless you think they were told by the seller and did not disclose this to you I do not think you have a case. You also could have had a pest inspection and I assume you passed on that? Bill, This is a great place for simply answers to hard questions. I have pointed several people to it that are looking in MA. Here is my issue and question, in short hand. I bought a house in MA (two family) that was built around 1920. During the closing, we were given a partially executed lead disclosure statement, signed by us. The seller’s attorney was to get the sellers to sign the statement (no known lead paint, but house is old) and be done with it. At the time I didn’t have children and it seemed like a simply paperwork matter. The seller’s attorney never sent the executed statement (this will make sense soon), but I also didn’t think anything of it. However, 7 years later I sold the place when I sold the place, it is now dominating my life and bank account. During my sales process, the buyer made a solid offer, but I had better offers and rejected it. My original sellers contract had the usual clause for mandatory inspections and finance verification. The buyer (now owner) then came back with a counter offer and affirmatively (without any suggestion from me or my representatives-this came out in depositions) waived the inspection, lead paint report, and finance clause- “in order to sweeten the deal” and “insure he got the property”-his words. The closing attorney for the buyer at my sale turned out to be the same attorney that did our closing when we bought, but represented the seller at the time. Anyway, about a year went by after I sold to the buyer and I got a demand letter from the new owner for more than $90,000 in lead paint damages. As of today, more than 5 years after the sale, no de-leading work has been done, his children are all well over 6 and he is not selling. So, no sales have gone bad. I refused his demand, noting that he had waived everything and that his agent and lawyer were involved in every step of the the sale. If he thinks he was wronged, he needs to look to his counsel and agent. I noted that he simply made a calculated decision to waive the clause and accept the risk in order to get the property. He even paid about $50K more than the asking price (miss those days). Now he is suing me alleging 1) I did not disclose a lead paint report on a state website -the website didn’t exist when I sold; 2) that his attorney (remember the same lawyer that did the closing for the seller when I bought it) has produced a report/lead paint statement with handwritten notes (not initialed or signed by me or my representatives) that shows there “maybe lead paint due to age of property”, but that we never noted it in the disclosure. Now mind you, I didn’t have the report cited by his attorney and the attorney never sent it to me. Also, my broker advised me in writing to fill out the lead paint statement as “no known knowledge” based on the fact that neither of us had specific knowledge-accept to note the place was built in 1920. I’m shocked that me and my broker are being sued for this by the seller -and you guessed it-the same lawyer that has now done two closings in less than a decade on the same property. Where do sellers and real estate agents get from under the liability of covering buyer’s stupidity and lazy lawyer syndrome? There has to be a water’s edge, and clearly it isn’t the P&S Contract or the 10 day window provided in MA. If there had been a lead paint issue, I promise I (or my broker) would have disclosed it. We had every incentive to do so, as we had multiple offers for more than the asking price. When a buyer takes the extraordinary measures my buyer did to get the property, while being advised by a seasoned broker and a lawyer (practicing since 1966 in R E) that had done a previous sale of the property to me, some level of reasonableness has to be recognized. Have you ever heard of this kind of debacle? What are your thoughts? Mike I am unclear about one thing….Did the buyer who is suing you sign a lead paint disclosure form? The fact he waived a lead inspection does not preclude you or the agent representing you getting a signed lead disclosure statement signed by the buyers. This is a mandatory part of any transaction in Massachusetts when the home was built in 1978 or before. What about agents handling rental property? The agent from which my son rented an apartment from told him that there were laundry facilities in the building. Now that he’s signed the lease and moved in he finds out there are not. He paid a fee to the agent – is he entitled to a refund and to whom should he report the fact that the agent lied? Stephanie this would be a question for a qualified lawyer who handles misrepresentation in real estate. Hi guys. I just bought and moved into a house about6 weeks ago. We had a big rain storm a week ago and now I have water damage in the house. I call the insurance guy out and he finds buckets sitting on towels in the attic from where the previous owner was trying to hide major leaks in the roof. The home inspector didn’t actually do his job and look around in the attic, and the seller didn’t disclose that their are lots of leaks and rotted sections of boards in the attic. Here’s the bottom line. I have to get a new roof. Insurance says I absolutely need to sue for non-disclosure of room leaks/rot. Anyone got an opinion or tell me how I start the process? Scott I am not a lawyer but I would suggest you get one. In my opinion it sounds like their was extreme negligence on the part of the home inspector. It is a regular part of an inspectors job to look at the attic. Obviously if he did his job properly you would not be in this position! I’m wanting to sell. Four years ago my neighbors and myself fought the owner of an abandoned asphalt plant to be revived. Last operated in 1964. After two years of zoning board meetings, the board unanimously denied the permits. The owner sued the town in land court and won. The town appealed the decision to the state Supreme Court and lost. Now the construction of an asphalt plant has begun 200 yards from my home. Do I have to disclose this? It has been in local papers for four years and is obvious to anyone driving by. Hi Thomas if it is obvious something is going on next door you can assume a buyer is going to ask what exactly it is. You will have to answer honestly. I rented a condo from a real estate agent who owned the property. After I rented it I found out that it was not habitable: 14 code violations, rats, it was a former drug sale house, there was loose asbestos in the water heater area by the front door, etc. Horrible experience. What are the laws in CA that would protect renters from deceptive real estate agents who have no intention on fixing defects. After the city MADE her fix the defects and after much grief and physical illness from this toxic rental. There is a hearing coming up this week. Any clues on what to say: I have full documentation on this and an attorney told me that it was worth $10,000 in small claims. I wish more wisdom on this. Barbara your questions are good ones but an attorney in California would be far better equipped to answer your questions on Real Estate disclosure laws. We bought a home in Nov of 2011 and were told by the seller that it never gets water and has never seen water. We have a wall in our home that is rotten because of damage from siding or roof work that was not done properly. So we will now have to replace the exterior wall. I was also recently told by a neighbor that the home had flooded years back, while being sold by the owner before them. There had been water leaking in the second floor bathroom through the ceiling of the first floor, and led the water into the basement and out of the basement door. The water had to be shut off he says? We did not have an inspection done because we were told that the bank was doing an inspection. Is this covered in a MA disclosure law? We also have 4 children in our home. Trish the reason you have a home inspection is for the exact reason you describe. You would need to show that the seller knew about the issues as you describe in order to have a case. My son recently closed on a house in MA. In the disclosure form, it stated the the house had hardwood floors throughout the house. The house had wall to wall carpeting. A couple days after closing, my son removed the carpeting in a room and found that one room has asbestos tile under the carpeting with no hardwoods under the tile. He is now getting estimates on getting the tile removed and hardwoods installed. It looks as though the costs will be in the $2,000-$3,000 to have the job completed. Does he have any recourse in this matter against the sellers? In advance, thanks for the advice. Hi Bob – Yes potentially he does have a case. This is something you would want to talk to a lawyer about. The question becomes whether you could get the seller to pay for the lack of hardwood floors. Hi..my son sold his house in Aug.2013. He had a reputable real estate agency and the deal went through. There was a home inspection done and a few minor problems that were brought up were resolved. Now the home buyer is stating that she was defrauded because she had a leak in an upstairs bathroom and her living ceiling was ruined. Her contractor said there was mold in the beams in the ceiling, and said my son must have had a water problem previously. My son did not have a water problem other than a side panel at the tub enclosure that was replaced before the sale. The buyer is also stating that the sump pump in the basement is drained improperly. The sump pump was disclosed before the sale. The buyer also had her own contractor at the property before the sale to look around since she wanted a vent put in the downstairs bathroom. My son is now being sued by the buyer ( after 6 months ) for fraud . The buyer is stating that he must have known about the leak in the upstairs bathroom and also for the sump pump drainage. Does the buyer have a case ? Joan – I am not an attorney but will try to answer your question based on my knowledge of how the laws work in Massachusetts. If the property is located elsewhere the answer could be different. In Massachusetts a seller is not under any obligation to disclose anything unless they are asked a direct question. It is a “buyer beware” state. If the buyer however asked a specific question and the seller answered the question dishonestly then a buyer could absolutely sue and would probably win. Based on what you told me it doesn’t sound like that is what has happened? We purchased a new home in a new development. The plans show that there are about 50 more single family lots to build. The developer now has a proposal before the town to put in a 26 unit assisted/section 8 apartment complex smack in the middle of the neighborhood. Is the neighborhood trust/association/ developer sending a letter to us now sufficient? They have been meeting with town already. We received the subdivision plans when we purchased. Even a few days ago I was told by a site manager they still had 50 homes to go. We wouldn’t have purchased if we knew about apartment complex in our backyard. Any suggestions? Thank you! Hi Margo – I am not sure I understand your question. Are you asking if a seller is allowed to change their plans? I don’t see how this is a disclosure issue?